We are thrilled to announce that our colleague, Taner Kılıç, Honorary Chair of Amnesty Turkey, has been released from jail today after over 432 days in prison. “We are overjoyed at this news. 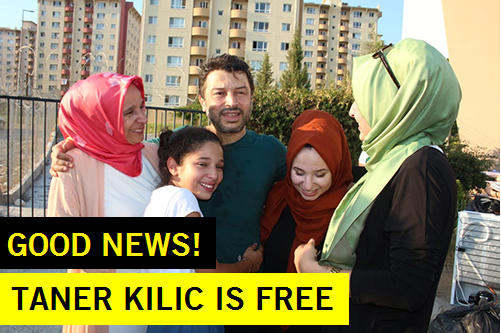 It has taken us more than a year of campaigning and struggle to get here, but it appears that Taner will finally be freed." Kumi Naidoo, Amnesty International’s new Secretary General. Thank you to all of those who sent messages of solidarity for Taner as part of Write for Rights 2017! February 2018. Solidarity action after Taner’s release and re-arrest. February 2018. Amnesty International Canada's Secretary General, Alex Neve, handed out letters from supporters to the Turkish Ambassador. Taner was arrested on 6 June last year and sent to jail three days later, where he has languished until today. Ten other activists known as “The Istanbul 10”, including Amnesty Turkey’s Director İdil Eser, were locked up a month later. Eight of them were held for almost four months before being released on bail at their first hearing in October. They all face the same baseless charge – “membership of a terrorist organisation” – a ridiculous claim made time and time again by the Turkish government to justify its attempt to silence human rights defenders. Since the attempted coup of July 2016, 150,000 people have accused of dealings with the “Fethullah Terrorist Organisation”, which the Turkish government claims to be behind the rebellion. Some 50,000 people are currently jailed, including at least 100 journalists – the highest number of any country in the world. What’s more, over 100,000 public sector workers, including a quarter of the judiciary and hundreds of academics, have been arbitrarily dismissed.